Atletico Madrid's on-loan goalkeeper Thibaut Courtois is relieved that he has been cleared to play against parent club Chelsea in the Champions League. Uefa waived a fee that Atletico were due to pay Chelsea after the two clubs were drawn together in the semi-finals. 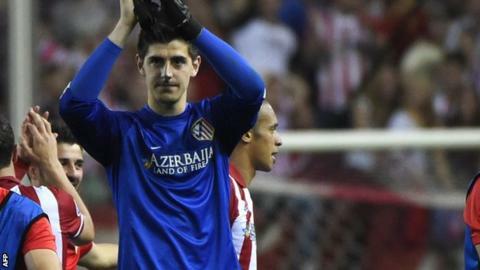 Courtois, 21, is in his third season on loan at Atletico from the Blues. "I'm very relieved. That we've drawn Chelsea is special because even though I'm at Atleti, Chelsea are my club," the Belgian told Fifa.com. Games will be played on 22/23 April and 29/30 April. Atletico president Enrique Cerezo had said his club could not afford to pay the fee Chelsea wanted for the two games, reportedly about £5m. But Uefa said the agreement was "null, void and unenforceable", allowing the La Liga leaders to select the 21-year-old for the two-legged semi-final. The Spanish club qualified for the last four of Europe's elite club competition for the first time since 1974 when they beat Barcelona 2-1 on aggregate. "I want to win trophies here and I'll be an Atleti supporter for these two games, but at all other times I'm a Chelsea fan too," added Courtois, who has never played for the Stamford Bridge club since signing a five-year contract on his arrival from Genk for an undisclosed fee in 2011. "I hope they win the Premier League, just not these two matches. I really hope we can reach the final as we're so close. They're the favourites, but Barca were too."